Her eyes slowly bled from half-vamped-out to simply human dark. Which was a good thing. I didn’t want to have to fight the girl. Despite her power, I might hurt her. And despite her freedom in the human world, and her insistence on being in control of her vampire gifts, the control of vamps as young as she was minimal to moderate. Shiloh Everhart Stone had long straight red hair, dark eyes, and a pointy, not quite perfect nose. Her skin had that glowing, pinkish look that well-fed vamps always had. Leo had decided that a hungry witch-vamp in a training camp full of witches might be tempting fate, and so, today, she had been given a coterie of humans to feed upon every night when she woke. I thought it was a great idea. But Shiloh had dug in her heels about relocating, and when an Everhart went stubborn, it was like trying to get the moon to rotate to Mars. Not gonna happen by any power I had. Well, except the power of Leo. He too wanted her to make her own decisions, to be grown-up and wise. He wanted her to see the wisdom of the move and agree to it. He wanted her to learn that control she so desperately lacked. “Yes, sir, it was a mistake,” Shiloh said to Leo. “But no one got hurt. I have control. I do,” she said softly. Moments later, her shoulders dropped in defeat. She had sworn to Leo, she had drank his blood and he hers. She literally couldn’t say no to him. Under other circumstances I might have felt guilty for playing the blood-tie card. But not this close to the Witch Conclave. She ended the call and handed the cell back. There were perfectly human tears in her eyes, until she set her gaze on me. Then they vanished and the familiar tilt lifted her chin again. Stubborn. “This is so not fair,” she spat at me. “You didn’t have to call him. I hid my grin and glanced at Evan, who was sitting across the room from us in Shiloh’s recliner. He had claimed it upon entering and, at six and a half feet tall and well over three hundred pounds, he could sit anywhere he wanted. Even in a vamp’s favorite chair. He was sipping a beer and shaking his head. I didn’t have to be a mind reader to know he was thinking about his own family and how soon he’d have a teenaged daughter to deal with. A powerful teenaged daughter who had more access to magic than all the three witches in the room together. Big secret, that part about Angie Baby. “Aunt Jane would defer to your witch aunt,” I said. The window next to Shiloh’s head exploded inward. Something small and dark whipped across the room. We have a copy of Blood in Her Veins for one lucky VBC reader. This contest is open to U.S. addresses only with the prize being provided by the publisher. Use the Rafflecopter form below to enter. Jane’s CHUTZPA is the biggest reason I love the series. Nothing will stop her once she’s determined to win whatever situation she finds herself in. Sort of like me. I’m entering every giveaway in this tour just so I can win a copy of this book for my home library. And the Earth’s Book Nook appearance isn’t there(?)! I can not wait for tomorrow. I love the character development in this series. All of the main characters are compelling and have depth to them. There aren’t “roll your eyes” moments with these books. Faith Hunter knows her art. The relationships are what make the books favorite rereads. How everyone interacts, learns, evolves thru the series. Jane isn’t stuck make the same mistakes over and over (Stephanie Plum) and all the vampires and weres are believable as sentient, dynamic beings. The spice of action, something to solve, and the twisty surprises tie it all into Keeper Shelf status. Waiting impatiently for the book release tomorrow. The characters, especially Jane, continue to grow and evolve over the course of the series. The characters are extremely well developed, as is the world in which they live. 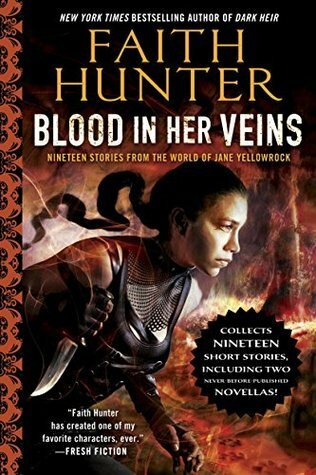 My favorite thing about the Jane Yellowrock series is its entire world and its characters, which are deeply defined and “alive” (pardon the pun about some of them who are not – alive). Thanks for hosting this part of Faith’s blog tour and allowing her readers to follow the short story as it evolves. Love this series? Found it after, I read the first four books of the Mercy Thompson series waiting for the next one. So glad I did. Got hook on this series too. I just adore Jane and Beast! Such fabulous characters. Jane’s relationship with the Youngers. What’s not to like? What more can a reader ask for. Faith Hunter delivers every time!! Jane is my favorite thing about this series. She pulled me in from the outset, and has kept me in all the way! haven’t read it; maybe the heroine? I love all the twist and turns. And learning so much more about Jane’s and Beast’s background. Thanks for sharing! What a lovely idea to have a multi-part short story as part of the blog tour! Thanks for the opportunity to win! I love Faith Hunter! and how they get along. They make me laugh. I also love how they each keep their own very distinct personalities while sharing a body/mind. Jane’s sassy personality and mouth make me laugh too. Just an overall feel good series about a powerful woman who is still a lady. I love this series so much!!! I love everything about Jane and her world!!!!!!!! This series has been on my GR to be readv list for awhile. I think 2016 may be the time to start a new female lead series and it’s paranormal. Even though I have not yet read this series, I have seen so many great comments about the books and would love to win a copy. I really must start reading it this year. I love this series, and this serialized story, but I’ve got to say, Jane Yellowrock doesn’t often make me think of Lee & Miller’s Liaden Universe. Who else knows what I’m talking about if I describe this as a melant’i play? Oops, I missed that I was supposed to state my favorite aspect. Hmmm … Well, I like the interaction between Jane and Beast. It’s a unique version of shape-shifter nature. The closest thing I can think of is Charles and Brother Wolf (by Patricia Briggs), but that’s a very different combo of personalities. I’m currently in the middle of book 8. I don’t know if I have a favorite thing about the series. I like how as the series progresses, we learn more about Jane and the world around her. I like how she interacts with her housemates, and the snarkiness she has with Leo. This is a terrific series! I love how Jane and Beast keep evolving. Jane keeps struggling with her relationships. Looking forward to reading this book! I love the relationship between Jane and Beast the most. Jane has the biggest heart and Beast knows what needs to be done to keep them safe.